The Most Valuable Thing We Carry Is Our Commitment. Our classrooms are 900 feet long and 5,000 miles at sea. We don’t carry a weapon. We carry 120,000 tons of them. We are trained on the latest navigation equipment. And the oldest. Everything we learn in this classroom will be on the test. The United States Merchant Marine Academy, one of the five federal service academies, educates and graduates leaders who are committed to serving American national security and critical economic interests. As licensed Merchant Marine Officers and commissioned officers in the Armed Forces, graduates of the academy are essential for securing the country’s commerce in peacetime and delivering our warfighters, weapons, and military supplies during conflict. Due to their elite training and real-world experience, graduates are ready to go on day one in service of American military strength and economic power. For 75 years, the U.S. 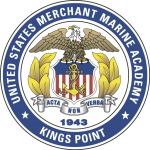 Merchant Marine Academy has prepared leaders of exemplary character, skill and commitment to serve America’s marine transportation and defense needs in peace and war.